Every day I’d go to my post box, key in hand, knowing that a letter would be there. A glimpse of the red, white and blue air mail envelope in the shadows of the box always lifted my heart. 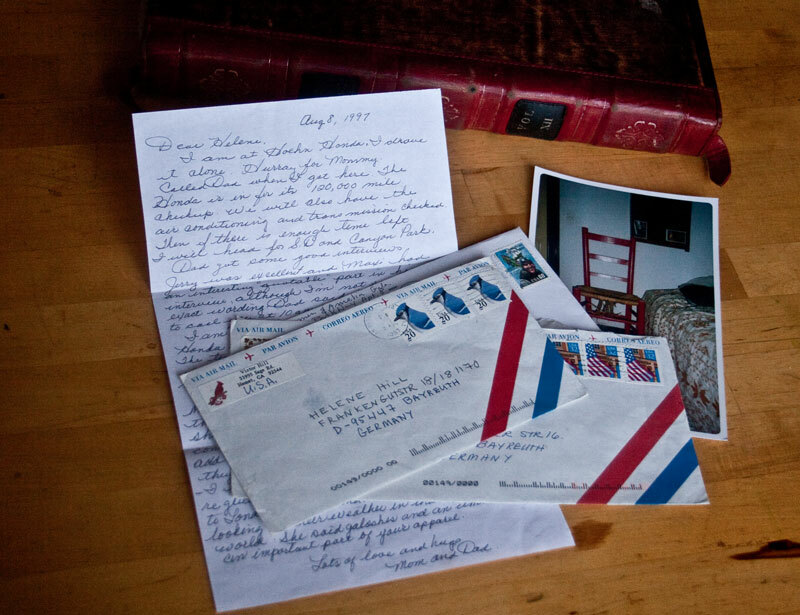 The letters followed me through my days and years in Europe. They traveled with me as I moved …from the makeshift cardboard box coffee table in Bayreuth, Germany, onto the red straw strung chair in the old Gothic quarter of Barcelona, Spain, to the shabby chic of the white nightstand in Montepellier, France. On Sunday all the town would be closed down. I’d lay across the bedspread with a pile of letters nestled near me. I sipped hot Chamomile tea in my favorite mug with the snail on it and smiled or cried or laughed or sometimes all three at once. When I was tired or lonely or upset, the letters soothed me with her soft voice. When I was happy they were there to laugh with me. For me, ‘Home’ is sharing love with the people you love. It’s that place in your heart where you know you are unconditionally loved, cared for …simply adored. Every letter my mother sent me was a little piece of home, a little piece of her love. I can never thank her enough, or tell her what it meant to me to have those letters with me as my friend, guardian and quiet reassurance that I was, am and always will be loved.